Today’s vote within the UN General Assembly gave overwhelming support to the Palestinian quest for nonmember status—marking a significant diplomatic development in the long-running Israeli-Palestinian conflict, which should give pause to political leaders in Israel and the United States. The General Assembly vote was never in doubt, given overwhelming support for Palestine within the Non-Aligned Movement (NAM) and Group of 77 that dominate the institution. According to the Palestine Liberation Organisation (PLO), at least 130 UN member states already grant sovereign status to the Palestinians on a bilateral basis. But the Israeli government had held out hope that it could at least marshal significant support what it termed a “moral majority” of UN states: that is, not an absolute majority, but a majority of right-thinking advanced democracies persuaded by both the normative and practical logic of the Israeli position: namely, that the prerequisite for final status negotiations is the presence of a credible and unified Palestinian entity that (unlike Hamas) has definitively renounced terrorism and accepted Israel’s right to exist. Thursday’s vote dashed that comfortable illusion. In the end, 138 countries voted for the resolution, 41 abstained, and only 9 voted against. The most striking shift is that the Palestinian Authority president, Mahmoud Abbas, was able to peel away support from states of an internally divided Europe, beginning with France earlier this week. Foreign Minister Laurent Fabius’s announcement that Paris—to Washington’s consternation—would vote for the UN resolution opened the floodgates. Spain, Italy, Norway, Greece, Belgium, and Denmark, among others, since adopted the same stance, while the United Kingdom and Germany pledged to abstain, rather than vote against the motion. Paris’s pivotal decision to support the Palestinian gambit reflected at least three motivations. 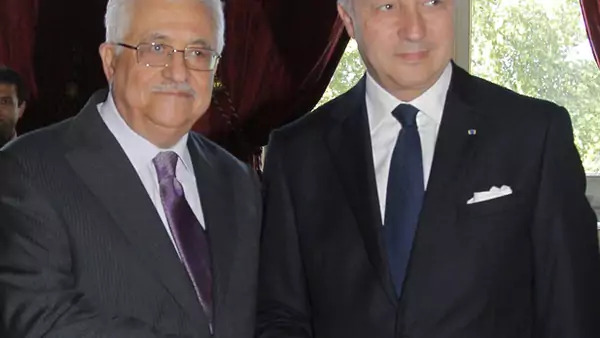 Fabius’s public explanation was that France had long backed Palestinian statehood; its vote for the resolution was thus a model of Cartesian “coherence and clarity.” A second rationale, according to French officials speaking off the record, was to give a victory to Abbas, in the hopes of bolstering his political position vis-à-vis Hamas, which has seen its popularity surge in Gaza and the West Bank after its confrontation with Israel. The third, unspoken desire—consistent with longstanding Gaullist tendencies in French foreign policy—was to demonstrate French and broader European independence from U.S. policy. To be sure, Palestine’s enhanced status in the UN will do little to change facts on the ground in the Middle East. As Fabius was quick to point out in endorsing Palestine’s bid, upgrading the territories’ juridical status is one thing. Achieving empirical statehood is quite another: the emergence of a truly sovereign and viable Palestinian state will depend on bilateral final status negotiations between Israel and the Palestinians. Beyond handing a symbolic victory to embattled Palestinian Authority (PA) President Mahmoud Abbas, Thursday’s vote underscores Israel’s growing international isolation under the hardline government of Prime Minister Benjamin Netanyahu. The question for the Israeli and U.S. governments is how to respond to this changing landscape. After initially fulminating about dire consequences if the Palestinians proceeded with the UN vote (including the possible abrogation of the Oslo Accords), the Israeli government has wisely toned down its rhetoric, recognizing that imposition of draconian sanctions, say, would be counterproductive. Israeli officials now declare that actual Palestinian behavior in the vote’s aftermath will determine their responses. The Obama administration, likewise, has sought to downplay the significance of the General Assembly vote, despite some calls in Congress for cutting off the considerable aid that the United States sends annually to both the Palestinian Authority and the United Nations itself. The administration recognizes that cutting off assistance to the PA would merely embolden Abbas’s adversaries, while withholding U.S. assessments to the United Nations would simply alienate the broader UN membership. Things will get much dicier for the White House if the Palestinian Authority seeks to build on its enhanced status by seeking to join an array of UN specialized agencies, as it did in securing membership in UNESCO last year. In theory, the PA already had the capacity before the vote to join up to sixteen UN agencies, from the World Intellectual Property Organization to the International Atomic Energy Agency. As I wrote last year, this gambit would pose a painful quandary for the administration, which is prohibited under a two-decade-old law from funding “any specialized agency” of the United Nations, which grants Palestine equal membership. This provision places the United States in the somewhat absurd position of giving the tiny Palestinian Authority the initiative in determining which critical international organizations the United States can support. To escape this dilemma, the Obama administration should pursue a two-track strategy. As it did last year, it should discreetly warn the PA that any moves to join these organizations would jeopardize continued U.S. aid. In parallel, it should reinitiate quiet conversations with congressional leaders to seek a national security waiver for these provisions, so the United States is not placed in a position of cutting off its nose to spite its face. Perhaps the biggest immediate risk, however, is that the Palestinians will use their new status to pursue membership in the International Criminal Court (ICC), to which neither the United States nor Israel is party. As an ICC member, Palestine would have legal standing to seek judicial rulings on claims (whether credible or specious) of war crimes or crimes against humanity committed by Israeli Defense Forces or Israeli officials. While any such accusations would need to pass muster with the chief prosecutor of the ICC, to say nothing of the ICC’s panel of eighteen judges, membership would offer the Palestinians another, legal instrument in their campaign against Israeli occupation, as well as another forum to shape international sentiment. In the short term, the vote will surely complicate efforts to get the two parties back to the negotiating table. In the longer term, the shifting diplomatic landscape will place additional pressure on Israel to move toward final status negotiations, despite the continued presence of Hamas as a major force in Palestinian politics.